For the past few months I have been attempting to investigate the social networks of digital diplomacy. My initial research dealt with the social network of foreign ministries. This analysis was based on the assumption that foreign ministries follow one another on social media in order to gather and disseminate important information. My second analysis focused on the social network of embassies to the United Nations headquarters in New York. I assumed that UN embassies would follow one another’s social media channels in order to gain insight into foreign policy initiatives and gather information on how nations intend to vote on UN resolutions and in UN committees. 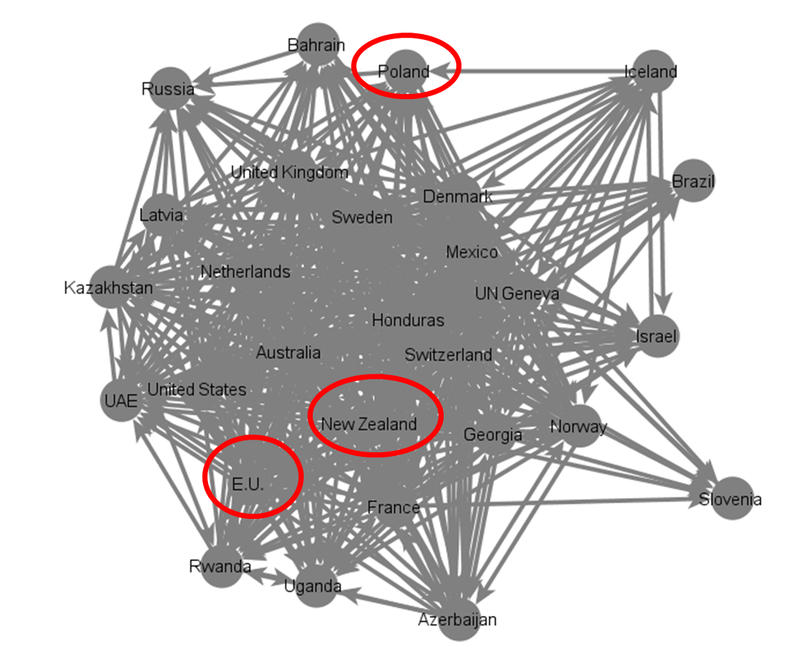 This week I analyzed the social network of embassies to the UN headquarters in Geneva. Geneva is one of the most important diplomatic hubs in the world as it hosts numerous UN bodies such as the UN human rights committee, refugee organizations, the conference on disarmament and the World Trade Organization. Moreover, Geneva is home to additional international organizations such as the World Health Organization, the International Red Cross and the International Labor Organization. Most embassies to the UN in Geneva are responsible for activities in both UN and non UN international bodies and are therefore regarded by foreign ministries as important centers of diplomatic activity. In an attempt to investigate the social network of embassies to the UN in Geneva, I created a list of all embassies that are active on twitter. To my surprise, only 27 embassies to the UN in Geneva are active on twitter as opposed to more than 60 in New York. Given the relatively small size of the sample, I decided to include the twitter account of the UN itself (@UNGeneva) in my analysis assuming that the UN also uses Twiplomacy in order gather and disseminate information within the diplomatic community in Geneva. Using the Visone program, I mapped this social network as can be seen in the illustration below. Note that most dense area of the network includes the most popular embassies in this network as well as those embassies that are the most avid followers of their peers in Geneva. The in-degree parameter measures each embassy’s popularity in the network. The most popular member of this network in the UN itself. This is of great importance as it indicates that the UN is able to use its twitter account in order to disseminate important information throughout the entire network. In fact, the UN is followed by all 27 embassies that are active online, a true fete in the age of Twiplomacy. The second most popular embassy in this network is the UK with the US coming in at third followed by Sweden and Australia. The out-degree parameter, which indicates the amount of other embassies with whom one embassy has contact, is of paramount importance. The higher an embassy’s out-degree score the greater its ability to gather and disseminate information in the U.N’s social network. The embassy with the highest outdegree score is Mexico followed by Switzerland, Sweden, Georgia and Denmark. 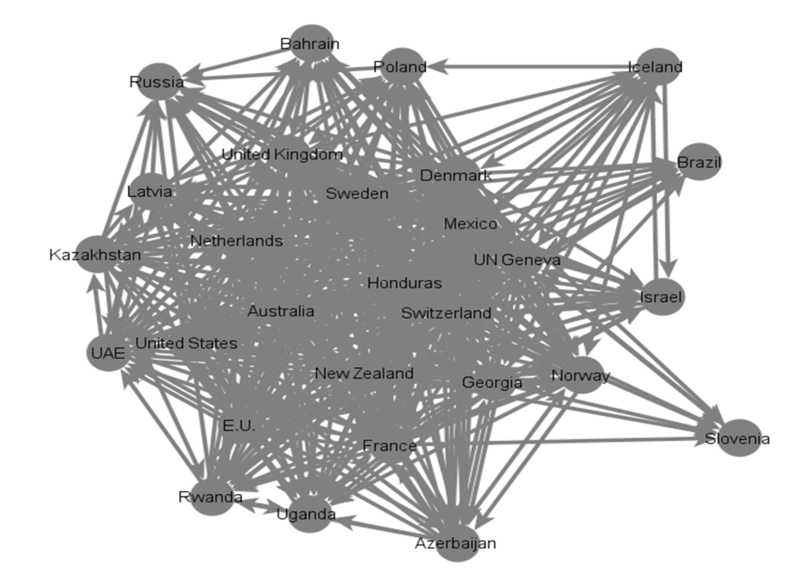 The final parameter measured was betweenness which reveals which embassies serve as important hubs of information as they link together embassies that do not follow each other directly. The account with the highest betweenness score was again the UN in Geneva. This indicates that the UN’s twitter account serves as a major crossroads of information. The embassy with the second highest betweenness score is Sweden followed by Mexico, Georgia and Switzerland. It should be noted that the only embassy to score high in all three parameters is Sweden’s embassy to the UN in Geneva. Likewise, it is interesting to find that Georgia scores very high on two important parameters; outdegree and betweenness. 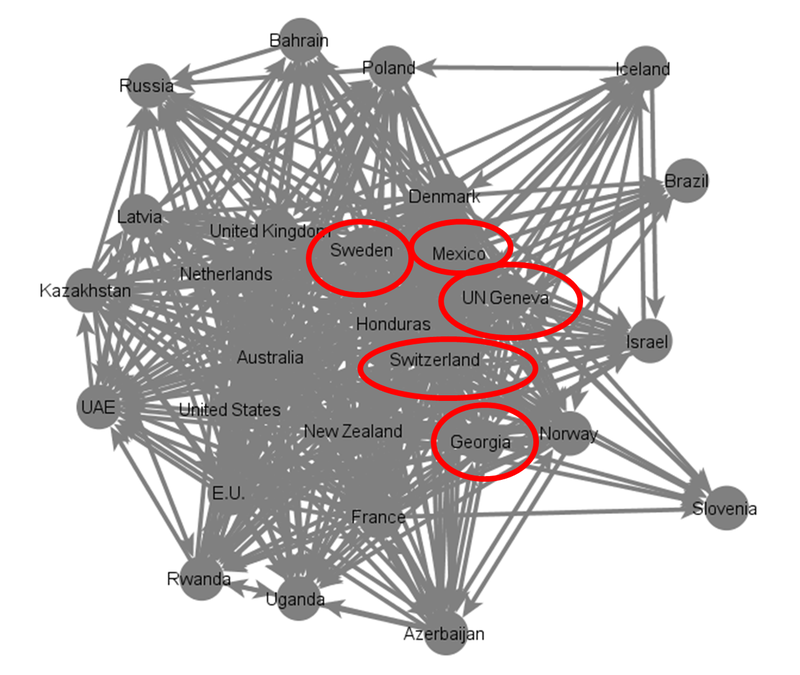 This finding could indicate that smaller countries can become important players in diplomatic hubs through Twiploamcy. Finally, as can be seen in the image below, countries such as New Zealand, E.U. and Poland that were central in the social network of embassies to the UN in New York are less dominant in the network of embassies to Geneva. Thus, it seems that the level of activity on twitter varies from embassy to embassy and is uniform across all embassies of a given country. What Are the Force Amplifiers of Digital Diplomacy?